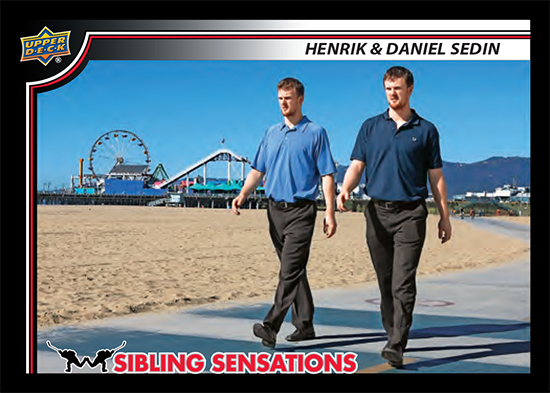 Available for American and Canadian NHL collectors, the exclusive 2019 Upper Deck Sibling Sensations Hockey cards are part of UD's new Family Weekend promotion. The #UDFamily event starts on February 15, which is the weekend before 2019 Upper Deck National Hockey Card Day. Given the focus of the promo is family, the 2019 Upper Deck Sibling Sensations Family Weekend cards are quite appropriate. 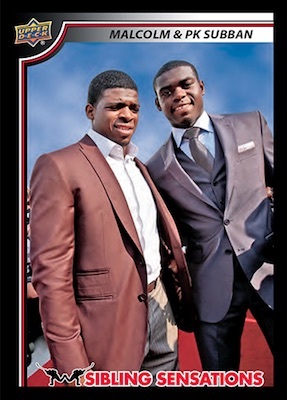 The set features brothers from around the NHL. The black-framed cards also dedicate a lot of text on the back to details about the various brothers courtesy of Sal Barry. As supplies last from February 15 to 17, collectors can earn an eight-card pack by spending $25 or more on 2018-19 Upper Deck NHL cards. 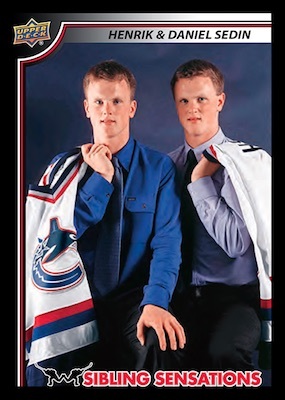 While each pack has the set, the short-printed SS-0 card is a second version for the Sedins. This SP is randomly included in packs so it will take extra work to build the complete set. The 2019 Upper Deck Sibling Sensations Family Weekend promo is exclusive to Certified Diamond Dealers (CDD) in North America who signed up during the 2019 CDD Conference. A full list of stores is provided on the Upper Deck blog. It is still always recommended to check with your local shop in Canada or the United States to verify they are participating.